These creamy herb filled bacon rolls are sure to be a hit at your next party. As a low carb appetizer it’s easy and delicious. 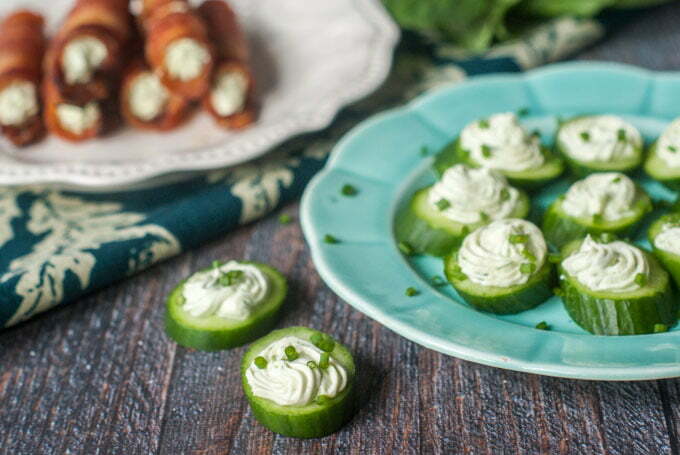 The herb cream filling can be used on cucumber slices as well. Most people when faced with a piece of bacon cannot resist. 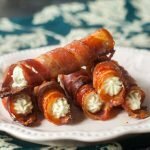 Well imagine said piece of bacon in the shape of a lady lock and then it’s filled with a creamy garlic and herb spread. Can there be anything better than that? I say no. I have been going through a bacon phase where I want it all the time. Lucky a package doesn’t stretch very far in my family so I only eat it once a week. However when I set out to make these creamy herb filled bacon rolls I bought a nice, thick bacon and claimed it as my own. By the way these are both low carb (0.7g net carbs) and keto (80% fat / 2% carbs/ 18% protein). My low carb friends, I wanted to let you know about my low carb group on Facebook. I would love to see you there. My low carb blogger friends are also sharing their fabulous recipes and tips. I’ll be sharing tips, menu ideas, advice, etc Check it out by clicking below. Let me come right out and say I that I did not invent the bacon roll. I found it in a fabulous cook book 30 Day Ketogenic Cleanse Reset by Maria Emmerich. If you are new to keto or are interested in learning more I highly recommend her book. She has been doing this for a long time and knows what she’s talking about and her recipes are so interesting like her bacon cannoli that I adapted for this recipe. One thing that I had to buy to make this recipe were mini cannoli tubes. You might have them if you make cannolis or lady locks but I did not. I also bought an icing bag and tips but I’ve used them for my low carb thumbprint cookies and my frozen whipped cream clouds so I’m getting a lot of use out of that tool. You can find these items on my Amazon page for this recipe if you are interested. 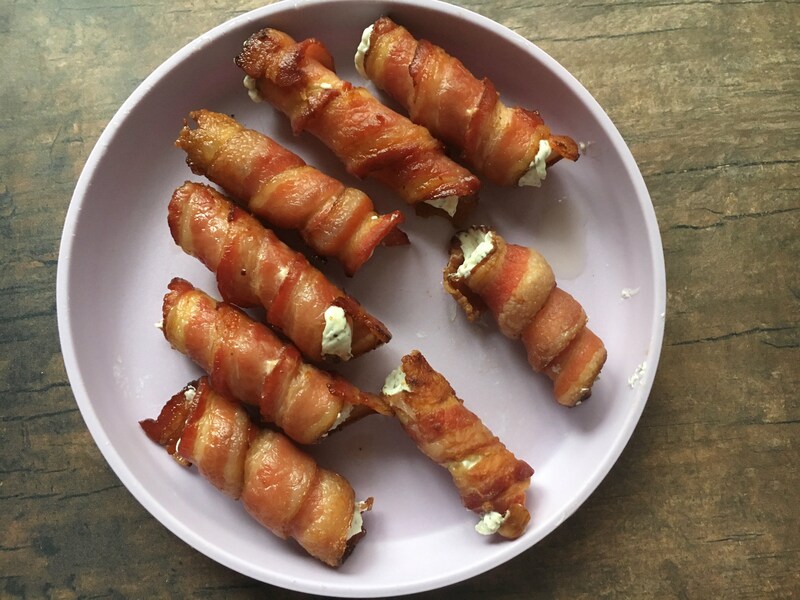 To make these tasty treats, you just wrap a thick piece of bacon around the cannoli tubes and bake for about 25 minutest depending on the thickness of the bacon. You want them to be nice and crispy but not too crispy that they will crumble. In the meantime make your herbed cream cheese by adding herbs, cream cheese, cream and garlic to a food processor. Add the herbs and garlic first to mince and then the cream cheese and cream. Spoon into a icing bag and when the bacon rolls are cooled, pipe in the cream cheese. If you have extra herb spread it is excellent on cucumber slices for a vegetarian option. pipe filling into the cooled bacon rolls. 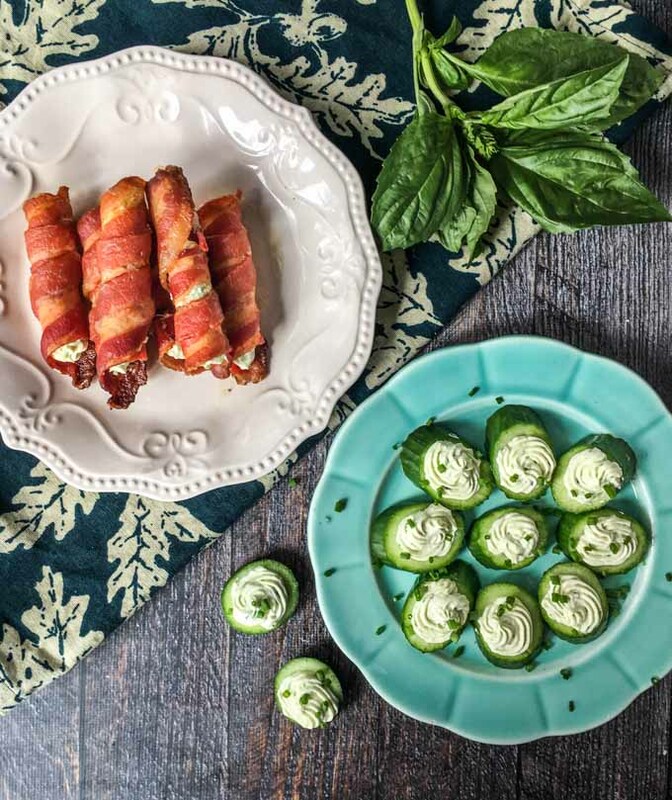 These creamy herb filled bacon rolls are sure to be a hit at your next party. As a low carb appetizer it's easy and delicious. The herb cream filling can be used on cucumber slices as well. 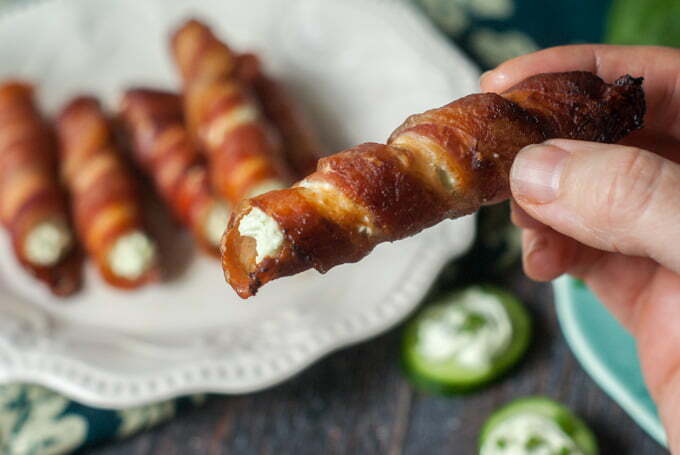 Take a piece of bacon and wrap around a cannoli rod and keep. Bake for 25 minutes or until bacon is crispy but not crumbly. When bacon rolls cool, slide off cannoli rod. In the meantime add herbs and garlic to a food processor and pulse until minced. Add cream cheese and cream and process until well blended. 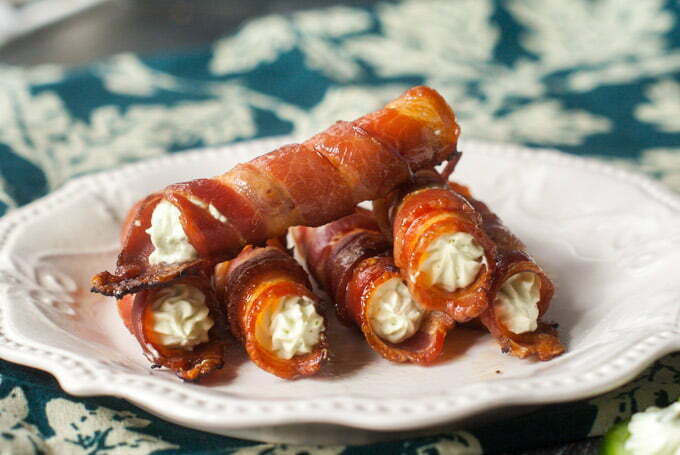 Spoon cream cheese mixture into an icing bag and pipe into cooled bacon rolls. Serve immediately. Mixture can also be piped on cucumber slices for a vegetarian option. Can the bacon wrap be made in advance? The day before? If so how do you store them? Honestly I think they will get chewy instead of crunchy but they would work. I would store them in the refrigerator. If you are using thinner bacon that might work better as far as being crunchy. Sorry I’m not much more help. I’ve just made them and ate them. Hi Tracey, I made these and refrigerated them over night (just the bacon) and they were fine. The two separate ones in this pic are the ones that have been refrigerated. Hope that helps. I made these today and had a few problems. The bacon was tricky to get off the tubes. I only had 8 tubes but even so, there was only enough filling for 6 of them. Did you use mini cannoli tubes? I can’t imagine how you’d fill 18 of them with this recipe. The few I got tasted wonderful. Hi Patti, I’m sorry it didn’t work out for you. They were tricky to work with but spraying them helps. As for filling 18 rolls, you are probably right. I used half of it to do the cucumbers so I will fix the recipe. Thanks for bringing that to my attention. I do think it should fill 10-12 of them though. Maybe it’s the width of your tubes? Mine were very small. I’ll have to remake this and give better proportions. Again thanks for bringing this to my attention. Hi Patti, I’m sorry but I just got around to remaking these and I feel you can easily get 12 bacon rolls filled. I think I was not clear before but these were mini cannoli tubes. Here is a picture of 8 that I did and I still had almond 1/2 a batch of cheese left over. Hope that helps and sorry for the delay. I’ve always thought cannolis were somewhat large…the size of an eclair. These look like finger size. Did you use a mini cannoli tube or regular 5″. How big around are these? I really want to make them. They sound awesome! Would you recommend using tin foil of you don’t have cannoli tubes? That is a very good idea! I have not tried it but that should work. You would have to get it just right but it should work. Let me know if you try it….I’m anxious to see if it works. I’d like to become a member of your closed Facebook group, Low Carb Living. Thanks Cheryl! I see you already became a member. I always use heaving whipping cream because it has less carbs. I’ll go fix the recipe. Thanks for bringing that to my attention! I assume that the bacon comes off the cannoli tubes, because I’ve never used those? 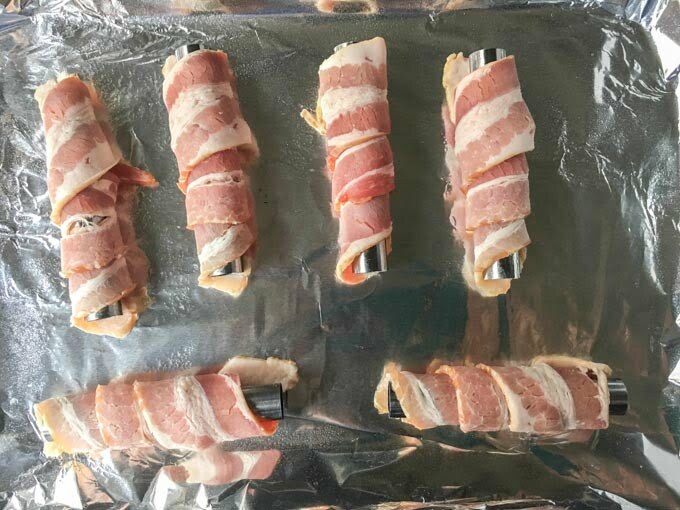 Does the bacon stick to these tubes? You have no instruction to remove the cannoli tubes so it sounds like your piping the cream into the cannoli tubes. Yes, Lana, that is correct. Sorry for that. They came off easily for me. You can spray them with cooking spray if you are worried but since bacon is so greasy they do come off.